1. My hair. It has officially been * fixed, * at least, sort of. The only thing that would cover up the cherry blossom pink was brown and dark red. So...that's what I've got. I've never felt more mousy in my life, but it is what it is, and it's only for a season, so I'm not losing sleep or anything over it. I'm still leaving threatening illustrations tacked to the door of the salon, but fewer now, and with less red ink. 2. My dear friend Jeremy gave me a gift subscription to deviantART, which is a website art gallery full of amazingly talented artists. This site has everything: painters, digital illustrators, photographers, writers. And it's a very international crowd--I get just as much feedback from artists in New Zealand or Slovakia as I do from America. I get encouraging emails in Hebrew and Russian now, and Polish girls digging my stuff. There's not a single unkind sentiment in this community. So I'm loving it. Here's the link to my gallery, but you don't have to visit it or anything. I'm still working on it a lot, so I feel like this is more of a sonogram than a birth announcement. 3. Last Saturday--or was it the one before? What day is this? 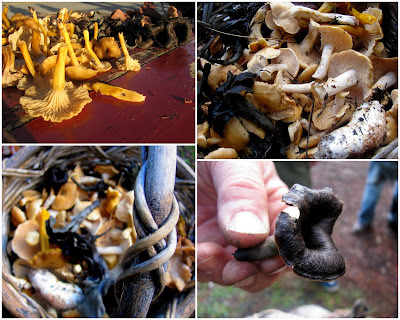 Who am I?--a friend and I went mushroom hunting at Salt Point, and it was AWESOME. Apparently this is all the rage out here, this harvesting-wild-mushrooms thing, and we came across a handful of other hunters out in the coastal forest and they had apparently been out there early early in the morn because their baskets were full and their hearts merry and their instructions plentiful. We found a ton of yellowfoot chanterelles and black trumpets and hedgehogs and pig ears (all mushrooms I learned that day). 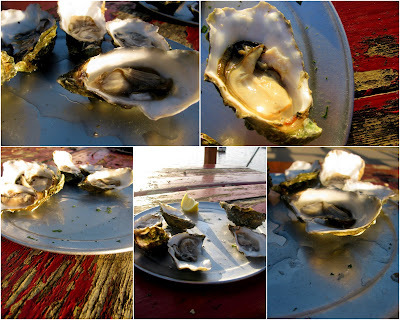 Then on our way back at sunset to San Francisco--our fingernails blackened and hands rough--we stopped by Tomales Bay for some oysters on the water. I cooked my mushrooms that night by sauteeing them in butter with onion and pepper and serving them over a bed of angel hair pasta. And they were ridiculous. Almost as ridiculous as these oysters. This is the ocean in the morning. This is the ocean at sunset. So I'm okay with the weather, really. I think it's giving more than it's taking. I'm going to bed now even though it's not yet nine o'clock because I'm a bit under the weather, and I'm at a good bit in my book, and there's nothing that sounds nicer right now than heavy blankets and a lamp. I hope you're doing well and I get to see you soon. your description of the oysters on angel hair pasta and your photos of oysters are making me hungry.. ..I'm off for a box of macaroni cheese..